Ecosystem marketing is a new and powerful concept in digital marketing. It is a critical component of any sophisticated and penetrating digital marketing strategy. The chart above is a “top-level” ecosystem map for the New York Times. It shows the most important members of the New York Times network of connections: where its traffic comes from and where its traffic goes. The numbers tied to each connection in the ecosystem indicate relative importance. The lower the number, the greater the importance (like a Google search ranking … or a golf score). It could be said that the best (and worst) example of ecosystem strategy is demonstrated by the Russian interference in the 2016 US election. Further, we could say that Robert Mueller is conducting an ecosystem analysis to determine Russia’s role in the 2016 election. Online ecosystems are representations of real-world digital interconnectedness. Your website sits in a digital neighborhood, surrounded by other sites that make up your online ecosystem. Your competitors, partners, suppliers, and other stakeholders are all participants in your ecosystem. The pressing marketing questions are: Are you in the right neighborhood? Are you getting the best “return on attention” (ROA)? Ecosystem marketing is the process of positioning your idea, message or product in the right ecosystem to gain visibility, engage prospects, and capture attention. The discipline applies to all industries, where the Internet serves as a catalyst to amplify and increase a message, whether it be the instant diffusion of ideas, the spread of “fake news,” the viral success of an ad campaign, or the instant outpouring of support for a non-profit campaign. Industry Companies: The network of participants in your industry. This ecosystem often includes industry suppliers and distributors. Thought Leaders: The experts and thought-leaders in your industry or category. Category: The broad category of various products and services that you compete within. Product or Service: The specific products and services your business is selling. Customer Segments: The customer segments you target or sell to. 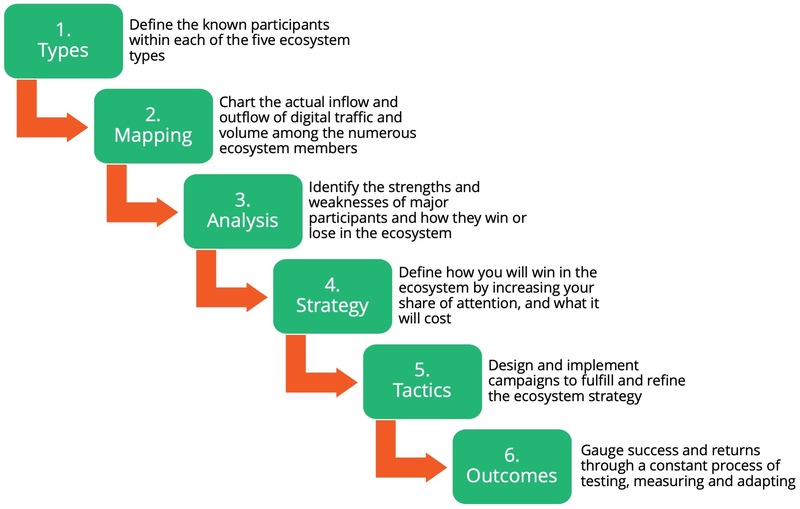 The first step in ecosystem analysis is to define the known players in all five types of ecosystems for your business. This primes the pump…or step two. An ecosystem map is the visualization of the online flows of traffic and their associated levels of attention or internet traffic. It can help you understand competition for attention in your industry, how your company is positioned vis-à-vis your competitors, and what drives attention in each ecosystem type. You can use ecosystem maps as a heat map of attention. It helps you understand what messages and sites receive the most attention in real time. This allows you to target your messages to the areas of the ecosystem that are most important to you. We use a proprietary tool to generate ecosystem maps. Maps are snapshots at a given moment in time. They are generated by accessing massive, real-time internet crawl databases. Over time, a successful ecosystem marketing strategy becomes evident in the shift of attention toward your company and the topics you champion. Which parts of the ecosystem are growing fastest, and which parts are in decline? How do you and your competitors compare in terms of relative share of the ecosystem? How do the leaders create ecosystem value? Where are we gaining or losing share in the ecosystem? How are the leaders using the ecosystem to drive sales and profits? Which parts of the ecosystem offer potential for your company because they are underserved or vulnerable to a focused attack? What capabilities are creating a competitive advantage for us in the ecosystem? Which capabilities need to be strengthened or acquired to help us compete in the ecosystem? What are the early signs of ecosystem disruption, failure or migration? What business models are best for our ecosystem? How do we create brand equity in our ecosystem? What are the major phases of your buyer’s journey, and which parts of it are well-served versus under-served by the current ecosystem? 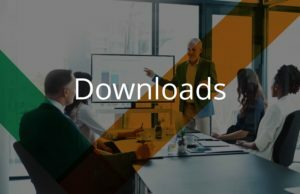 What personas are commonly active for your customers, and which ones are well-served versus under-served by the current ecosystem? What are the obvious cause-and-effect relationships within the ecosystem? What are the most relevant leverage points in the ecosystem for us to exploit. What capabilities (e.g., people, processes, systems) are required to exploit the leverage points and what are our capability gaps? Should we close the gaps internally or use outsourcing? Once you understand the dynamics of your ecosystem, you can create marketing campaigns to spread ideas, influence prospects and existing customers, and win the “war of ideas” in your industry. Monitoring and adjusting your ecosystem marketing campaigns based on real-time data is a critical part of tactical excellence. Return-on-Attention: How much attention do you receive and at what cost? Interactions: Are you interacting with the right players? What does your influence ranking look like? Quality of Interactions: Are you nurturing deep relationships with the ecosystem players you interact with? “Pull” Results: Are customers being attracted to your site? Are they engaging with your content? How deeply are they engaging with it? Are you improving your business performance by discovering new customers and creating deeper relationships with existing customers? 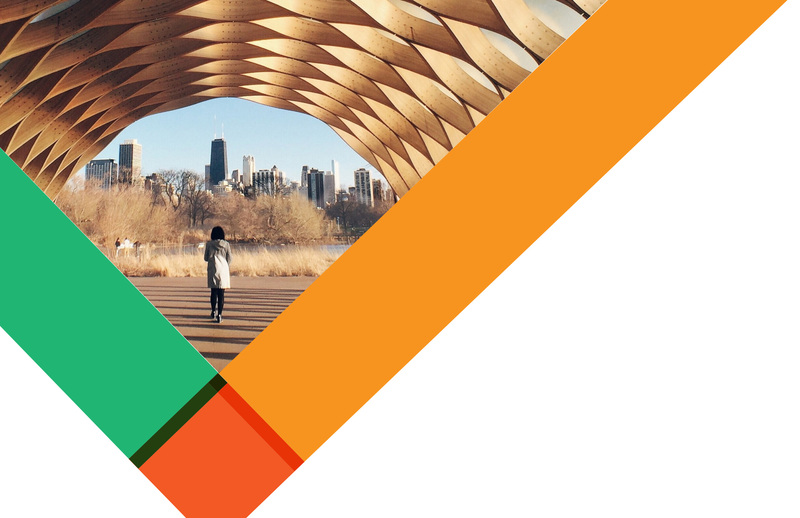 Findability: Are prospects discovering you? Sales: is there a financial impact that can be traced directly, or indirectly, to your ecosystem activities? Brand Equity: What tangible results can you attribute to ecosystem marketing activities?